Jane Austen may be the most well-known author in Western civilization, yet a shocking number of people seem to have a shocking number of misconceptions concerning her. 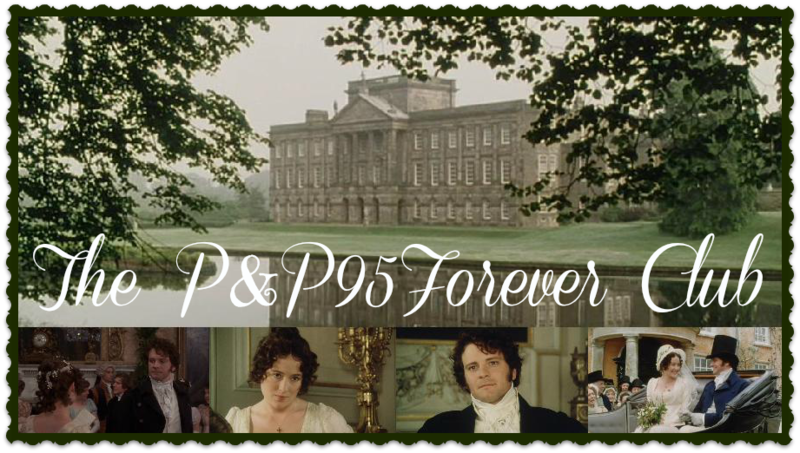 We can't possibly enlighten you as to everything you should know about her (though we'd love to dig into our unlimited wealth of information and do so if we had the time), but for now we shall present three facts about P&P that every good fan should know. No, scratch that. Here are three things that everyone should know about P&P. 1) Incorrect: Lizzie Bennett. Correct: Lizzy Bennet. Hey, spelling is just important. Jane Austen left off the extra T for a reason, and Lizzy-with-a-Y is delightfully... Lizzy-ish. 2) The mini-series upon which this blog is based is five hours long, not six, as is the common misconception. There are six episodes, but each episode is only about forty-five minutes in length. No matter what you hear anywhere else (and you will hear it many places), take it from us that it is five hours. Each disc in the DVD set lasts for 150 minutes and the whole thing is 300 minutes (check the DVD covers and IMDb if you do not believe us). Divide 300 minutes by 60 minutes and you get 5, yes? Yes. Case closed. 3) Pride and Prejudice is neither a Victorian novel nor a Georgian novel. (And where Literature is concerned, Jane Austen is generally put in the Romantic period.) The book was published in 1813, and therefore falls into the Regency period. This historical era extended from 1811 to 1820 (the period of time in which the Prince of Wales ruled England on behalf of his father, who had gone nuts). In the same vein, this is not an 18th-century (1700's) novel. It dates from the 19th century (1800's). Another Jane Austen misconception is that her novels are romances they are not (especially not Northanger Abbey which is a satire of the contemporary popular Gothic novels)-in her own words: "I could not sit seriously down to write a serious Romance under any other motive than to save my life, & if it were indispensable for me to keep it up & to never relax into laughing at myself or other people, I am sure I should be hung before I had finished the first chapter. No-I must keep to my own style & go on in my own way." Yes, thank-you for going on in your own style-we are much obliged I am sure! Livia Rachelle, thanks so much for pointing that out! It's terribly annoying how many people refer to Jane Austen novels as "romances"... I heard someone once call P&P "historical fiction," which is even worse! Yes, yes, I agree entirely! It does annoy me when people say that. Her novels are more correctly often called "romantic comedy" and people who call them romances are prejudiced numskulls. (Did I just type that out loud? Well, some of them, anyway.) And I love that quote. It's a perfect one to pull one somebody who calls them Romances. "Oh yeah? Well, my friend, a word from the Authoress herself. Put that in your pipe and smoke it." Well, that is what I would LIKE to say. Haha. There are some other general Jane Austen misconceptions that annoy me, too... (these were just the ones in connection with P&P) such as people thinking she wrote Jane Eyre. (Grrr. How appalled Charlotte Bronte would be...) And "Jane Austin"... that I simply cannot abide. Oh, looks like Miss Dashwood beat me in answering this comment... haha, and she is so much better at Not Rambling than I am. I am a sad girl. Heehee, I've got something funny to tell you. About the Regency period, the Prince of Wales and so on. So the Prince of Wales had to rule for his mad dad. And I've read that a Prince of Wales was the reason why Brighton was so bad- it turns out this prince was a womanizer and &, and Brighton was one of his favorite 'haunts'. I think it's the same Prince of Wales, but I'm not sure. ...THAT makes the Prince of Wales in The Scarlet Pimpernel either a) a madman; or b) a womanizer and &. I can kinda guess which one it is! :-) He does give Marguerite some really foggy gazes. Honestly. If I were Sir Percy, I'd wack him over the head if he wasn't the Prince of Wales (and if I wasn't the Scarlet Pimpernel). And yes, Livia Rachelle!! It drives me NUTS when people say they're romances. NO NO NO!! !